Nika 45 is a 33 mt luxury yacht in Turkey and Greece. It has 6 cabins for 12 people. It has been built in 2012. Designed just for your comfort. Built entirely of Teak and Mahogany with all Stainless Steel fittings, no expense has been spared to build a boat of quality that will last for many years to come. When the sails cannot be used twin diesel engines drive her to your destination effortlessly. Activities. There are many sport activities free on this gulet , including canoeing, wind surfing, sea ski, snorkeling and plenty of fishing lines. Also Water Sports and Ring are available. 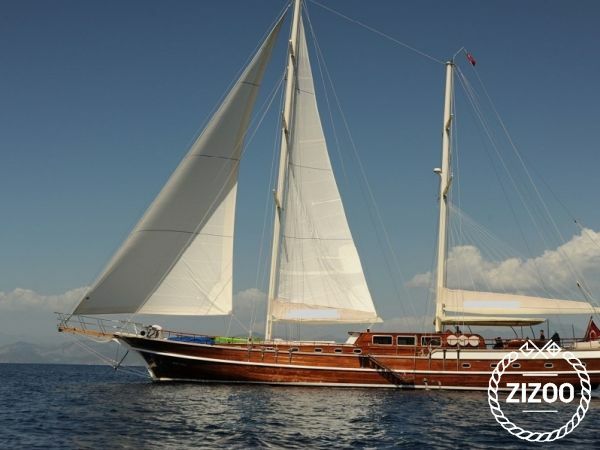 Insurance and Certificates: “Nika 45 ” like all the boats that work in Turkey and Greece must have full public liability insurance. The crew must have the correct certification for the job that they are doing and the boat must have the correct life support equipment on board at all times. Not adhering to this is a criminal offence and the Turkish coast guard stop all boats at sea on occasion to check the documents and equipment. You should take out your own normal travel Insurance as the public liabilit insurance on the boat will not cover you for most of the things that happen to holiday makers, like illness, lost items and accidents.